"Deity of the Year" toshitokujin 歳德神. Since she likes her place to be clean and tidy, people have to clean their homes too to welcome her. kure no sooji, kure no oo sooji くれのそおじ . until the 7th day of the New Year. This time is called "matsu no uchi", inside the home with the pine decorations. The New Year decorations must be set up a few day before the last day of the year. ichiya kazari　一夜飾り one-night decorations, an unlucky omen. And they are taken down on the seventh day. This is part of the Yin-Yang Theory of China, called "onmyoodoo 陰陽道" in Japanese. auspicious pine pole, ogamimatsu　拝み松. toshi jisan 年爺さん（としじいさん） "grandfather of the year"
This shrine was built more than 1500 years ago. It will be especially visited in January 2012, after the great earthquake and the destruction done in Fukushima and Iwaki town. If I remember well, the access road to the shrine had been damaged and is now in repair to make it accessible till the New Year visit for 2012. There are other temples of the same name 歳徳神社 in other parts of Japan. A kami that visits during the New Year's season, heralding the advent of the New Year, also called Shōgatsu-sama (lit., "Honorable New Year"). The name Toshitokujin has origins in Chinese Yin-Yang divination (Jp. 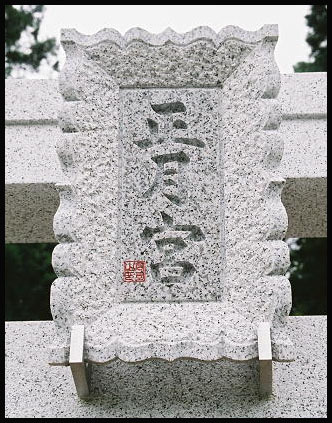 Onmyōdō), and refers to a goddess with dominion over auspicious directions (ehō) for the current year. 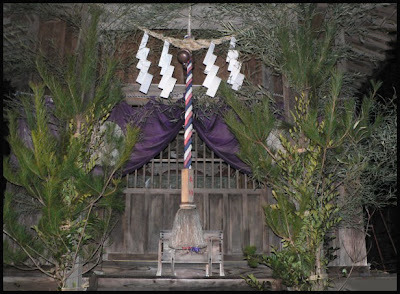 The Toshitokujin cult thus involves a core of ancient beliefs in the appearance of a kami at the first of the year and who assures an abundant harvest, to which has been added additional elements of Chinese divination cults. Observances to the kami of the new year are ordinarily held by individual families, who prepare a special altar apart from their ordinary kamidana, called variously toshigamidana, toshitokudana, or ehōdana; such altars may be decorated with shimenawa and mirror-shaped rice cakes (kagami mochi), rice, dedicatory sake (mike) and salt. 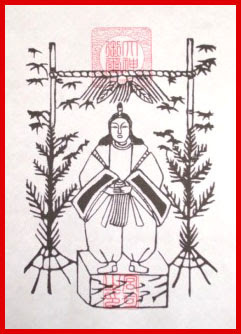 Derived from the cult of Onmyōdō, the names toshitokudana and ehōdana indicate that each year's auspicious direction (ehō) is under the influence of the Toshitokujin. 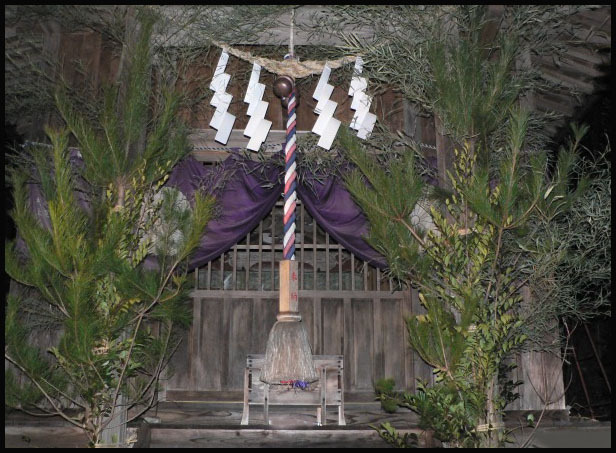 In some areas, a pillar called ogamimatsu ("supplication pine"), or pine branches may be erected beside the hearth as a vehicle or medium (yorishiro) for the kami's presence. 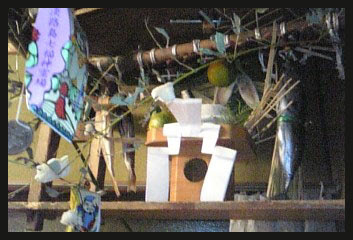 Both the conventional toshigami and the toshitokujin of Onmyōdō are alike in appearing during the New Year's season, but based on correspondences with the "spirit altar" (shōryōdana) of the summer Obon rites, and other similarities between ceremonies of New Year's and Obon, it is believed that the the toshigami represents a relatively earlier form of cult than that of the toshitokujin. This warmly humorous hokku is from 1824, when Issa was living in his hometown and hoping to meet the right woman to remarry after the death of his first wife and all their children. On the first day of the lunar new year (Jan. 31 in 1824) it was the custom to make a pilgrimage to the Shinto shrine or Buddhist temple where one's ancestors had worshiped or where they were buried. 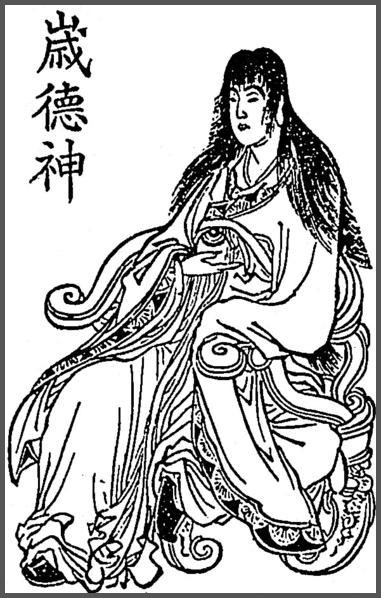 At the same time, it was also believed that the female god governing good fortune for the new year stayed in a different direction each year, based on the principles of Chinese Yin-Yang divination. In order to gain her favor, people had to walk in the direction in which this god of good luck was staying on the first day of the new year. In the country, however, there were fewer roads, and it was difficult to go to a shrine or temple where you normally worshiped while also walking in the lucky direction, so people often walked first to a location from which they could make their pilgrimage in the right direction. Even so, they often had to improvise new routes. In the hokku, someone has dressed in nice wooden clogs and his or her best clothes in order to visit a shrine or temple early on New Year's morning. In order to walk in the new year's lucky direction, however, he or she must leave roads and paths behind and head right through a vegetable field (as opposed to a rice paddy), a muddy place you don't usually walk through with nice clogs. A few vegetables may already be planted at this time of year, and there could be a bit of snow on the ground, so walking with clogs is probably difficult and hardly elegant. In any case, it is an odd sight. If the person wearing clogs is Issa, he is probably smiling at the way he must look as he picks his way through the field.
. Toshiotoko 年男 "man of the year" . This is the only shrine in Japan which rotates and changes its direction every year, so the visitors can bow toward the auspicious direction of the New Year. Eaten on February 3 for Setsubun !
. Ichiyoo raifuku 一陽来福 . ***** . Mi-Toshi no Kami 御年神（みとしのかみ） . The Four Kannon Temples of Owari Nagoya . In Tokyo I didn't hear about Ehou mairi. Is it popular in Kansai? This haiku refers to the New Year's custom of visiting a shrine or temple located in a lucky direction. It appears in Issa's 1795 travel journal, Saigoku kikô ("Western Provinces Travelogue"). Robin D. Gill (author of Cherry Blossom Epiphany) writes, "Plum blossoms rather than cherry blossoms are normal for the New Year season. Issa was delighted to find he could head in the lucky direction for that year and visit a temple with a specific cherry tree famous for blooming every year on the sixteenth day of the month. 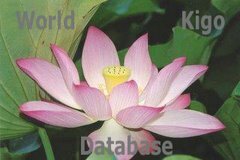 That is the day that the moon starts to wane, which gives the blossoms a slightly Buddhist bent, providing a subtle complement for the largely Shinto New Year." Another name for Tanokami　田の神　God of the Rice Fields. 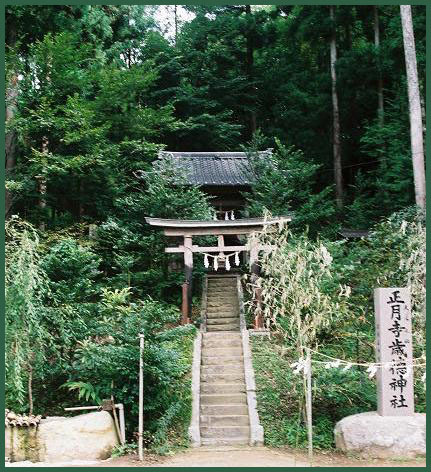 During the festival for Yamanokami, the 叉木家 Matagi family goes to the top of the mountain behind their home and the 上野家 Ueno family to the bottom of the mountain (where Tanokami resides) to greet and venerate Toshigami (Yamanokami).